From our legendary 3" Audi S4 Bi-Turbo system to our class leading Audi R8 and ground breaking VW systems, Milltek Sport is the proven product of choice delivering clear advantages in power, drivability and sound when compared to the competition. The dramatic success of the Audi/Volkswagen family of products being firmly established as sporting vehicles, lead Milltek Sport to build a wide range of products which cover models from the early Golf GTI's through Audi UR quattro to the current Audi RS3 and Mk6 Golf R.
Through Milltek Sport's network of distributors and tuning companies around the world, products are being continually developed to offer 'hard edge' performance with discrete looks and sound. 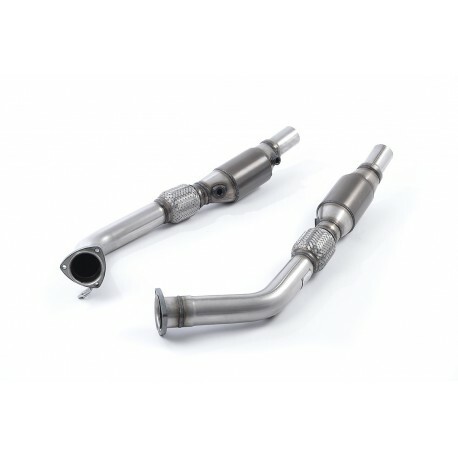 In the last 12 months, Milltek Sport have developed performance exhaust systems for many exciting new models including the new Audi A1, Audi A5/S5 Sportback, Audi R8 V10 GT, Audi RS3, Bentley Continental GT / GTC, SEAT Ibiza Bocanegra, SEAT Leon Cupra R 265PS, VW Polo GTI and, Porsche's latest 997.2 Turbo. Many of these vehicles have had the unique Milltek Sport Hi-Flow catalyst and down pipe assemblies developed for the maximum reduction in back-pressure - developed and tested through close co-operation with racing teams in series such as the British Touring Car Championship and the Volkswagen Racing Cup. Models such as the Mini Cooper and Cooper S are developed for worldwide distribution, rigorously tested on the rolling road and through many miles of subjective analysis. Milltek Sport look at a tailpipe styling, ease of fitment, vehicle specifications and power variances to deliver a quality, durable and, responsibly-engineered range of products to suit all environments. Recent additions to the range include the BMW 130i and 1 M Coupe, Mazda RX-8, Mercedes SL55 AMG, Mercedes C63 AMG, Mini Cooper S Coupe and Countryman Cooper S All4, Range Rover Sport 3.0TDV6 and, Vauxhall Corsa VXR Nurburgring. Milltek Sport doesn't just develop systems for petrol-engined vehicles either; recently the Range Rover Evoque and VW/Audi 2.0 and 3.0 TDI systems were developed giving a useful performance increase and greatly improved 'spool up' of the engine due to the larger pipe diameters and reduced back pressure.